Lorde continues to be as stubborn as Joffrey, refusing to relinquish her crown as the Queen B of the Hot 100. That’s ok with me because I luv Lorde and luv “Royals” and she’s welcome 2 stay at number 1 4 as long as she wants!!! I’m super happy 2 report that there are 2 new entries in the top 10 including the first boy 2 reach the top 3 in 7 weeks! That was so long ago, Lorde wasn’t even number 1!!! Unfortunately, we must bid a sad farewell to Ylvis, as the “The Fox” slips out of the top 10. Hey, at least it’s staying relevant! At this point, Lorde, you could totally be a royal! Miley needs to follow Lady Gaga to space and stay there forever!!! 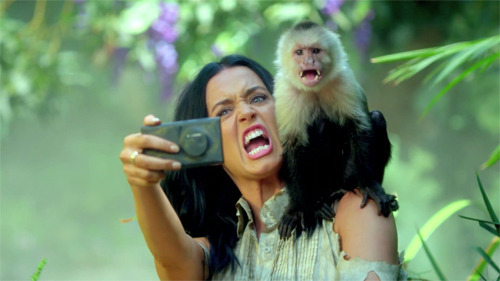 Looks like Katy Perry needs to roar a little louder. If you haven’t see AVICII’s live video from the YouTube Music Awards, I highly recommend it! I wish someone would write the story of MY life. It would be filled with lots of candy and glitter and horrible pain and more candy!!! Sorry, Drake. You need to hold on tighter or you’ll be going out of the top 10! “Demons” got a small Halloween bump, rising a spot to number 8. After rising last week, Lady Gaga’s “Applause” drops to number 10. She’s so unpredictable! Are you suffering from “Royals” fatigue yet? Let us know in the comments below!